When creating my self-promotion pack, I wanted to create a set of items that represented my brand in a specific way. I wanted to come across in a manner that was seen as luxury with a high quality to it, this was following my research of luxurious branding how they presented themselves as not just a product but as a way of life. 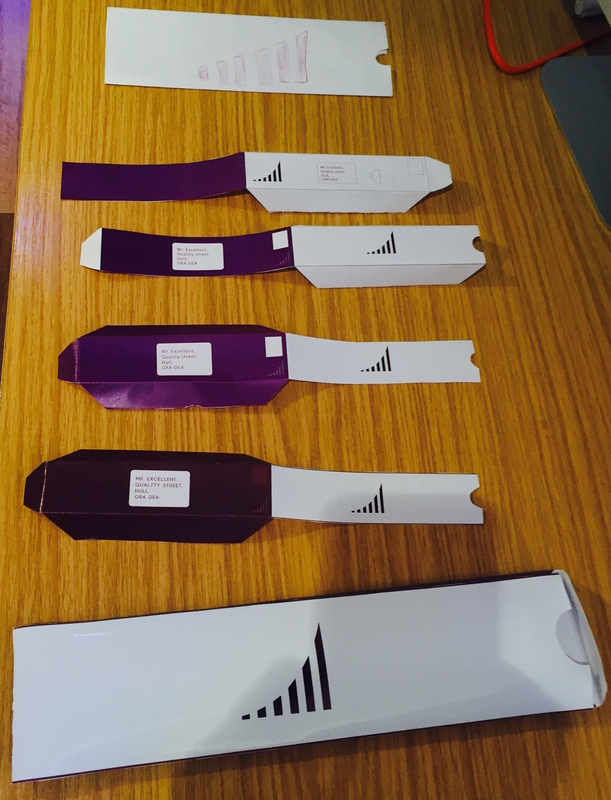 By using a maximum of three colours, two of which being different tones of purple throughout the packaging I have created general look across everything I have produced, this makes it easily recognisable as part of something produced by AKB Design. From my research about a self-promotion pack I knew that I had to create something that I could send out to the client so that I could close the deal. I wanted to create a little a package that would contain something that would be nice to look at and be an enjoyable experience for the client to open. In it I created a iPhone mockup which included information about myself such as what I can do and again contact details. I also created a mini poster that would describe their perfect designer and then explain that I am that designer. I also gave them a discount card within it so that they felt like they were getting a better deal. I also created a envelope for my letterhead that followed the same design cues as my promo pack. 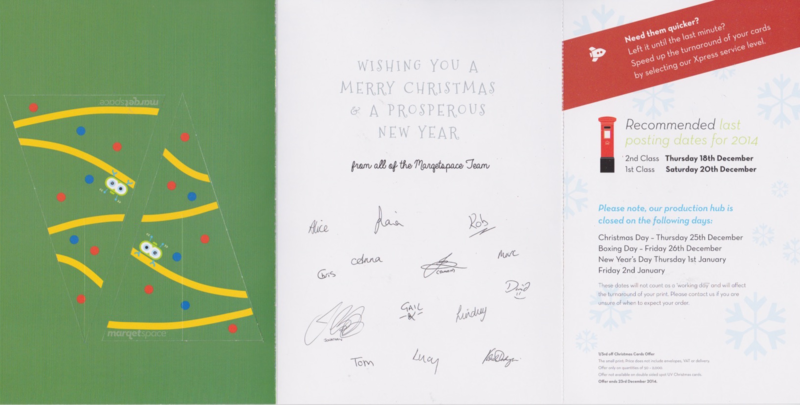 It had simple design which took advantage of white space which created pleasant packaging for the letter. It was folded and shaped in an unusual way which makes it stand out from the crowd, which is something that has to be done as a designer because then a client is more likely to use your services, because if you stand out from the crowd and are able to show you can make that happen for yourself, then you more than definitely will be able to do it for someone else. I think it was the depth of my research that really helped this stage become as successful as it did, understanding what others did allowed me to understand what I needed to do be professional but again what I could do differently to stand out from the crowd. Essentially my research allowed me to think outside of the box because i was researching what others ‘inside the box’ had previously done. An example of this was my business card, I wanted to create something that would explain what I did without really having to read too much on the card. Again research played a massive part in this because I found the most successful business cards reflected the line of work that they were representing, therefore I chose a the design of a laptop, and added my logo to it, on the screen I created a mockup that didn’t advertise google but reflected it so that people understood what it was, then showed alb design at the top. 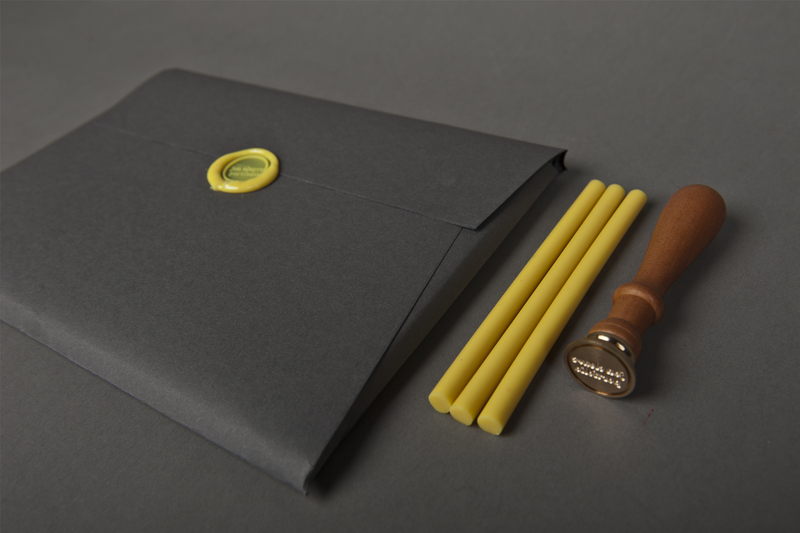 After creating the letter, I thought I would also design the envelope it would be sent in due to its’s unusual shape. I started with miniature versions due to it’s normal size being so large and created the different iterations, then I printed it out large scale. I have written the numbers 1-5 on the actual versions I have handed in so you are aware of which order they were made. Firstly I created the initial mockup out of paper creating the envelope and insert to go with it. I later decided this is the format I wanted the letter to be in because of it’s shape compared to what I then considered to be the actual marketing piece. I was reasonably happy with this step but was then somewhat forced to make some slight changes to the sizes due to decisions I had made when creating the letter design itself. This meant I now had a longer and slightly thinner envelope. Mockup number two was when I digitalised my designs and got the basic map of the envelope (I learnt this was required when creating envelopes from my trip to Wyke printers). I made sure that I had purple as the primary colour, the logo, address and stamp area. When creating mockup number three, I noticed the fact that the letter would be upside down because it would be coming from the left rather than the right so I changed this. I moved the semi circle to the correct position to allow the client to easily take out the contents of the letter. Then I flipped the colour side with the logo, I created a white box for the address area so that the font could stay purple then I added the stamp area. I also inverted the colours of my logo and reduced the opacity so you can faintly see my logo under the stamp. The fourth mockup I made was simply to add colour to the flaps as then I had given them some bleed. The fifth mockup was after I realised I had added the wrong tone of purple to the design and it didn’t match the other material I had produced, I also changed the stamp area size to match the specific measurements of a stamp. I also added a line of colour to the top and the bottom of this version as then it felt like it blended with the back colour better. You can see all the different mockups below and also the final version. 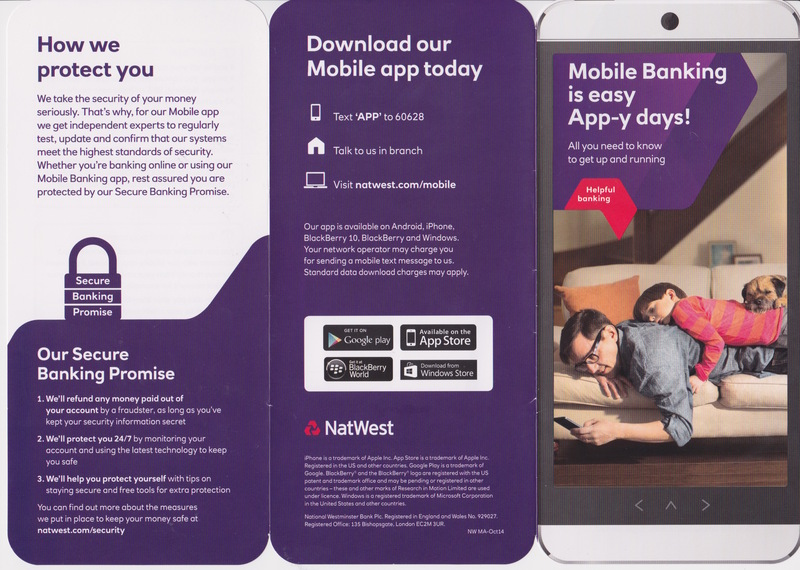 I am very happy with my overall product as it looks professional but like my promotional pack, I think if I had the opportunity to do this again I would print it on card rather than gloss as i feel the texture takes away from the experience. I would also add the full logo with words aswell as I don’t think it works without it. 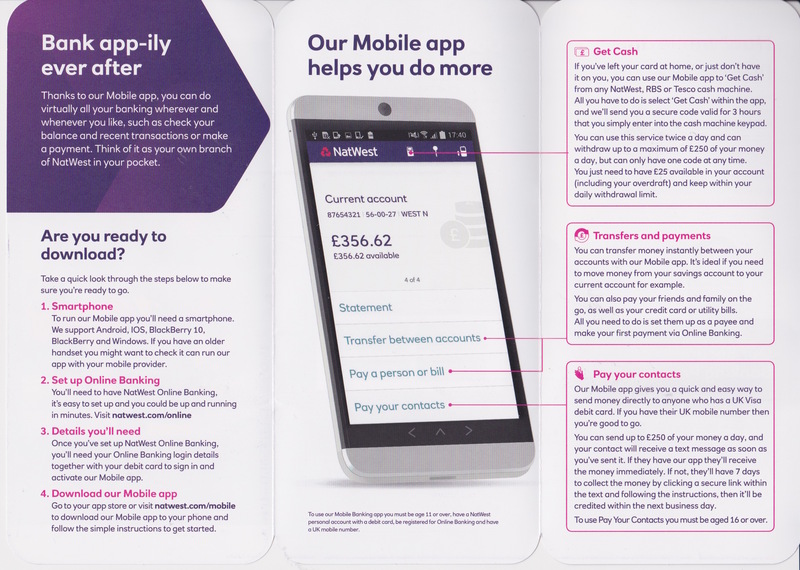 I came across this promotional piece for Natwests mobile banking app, it simulates a mobile phone with the actual leaflet within the screen, then when you open the leaflet it has the relevant content. 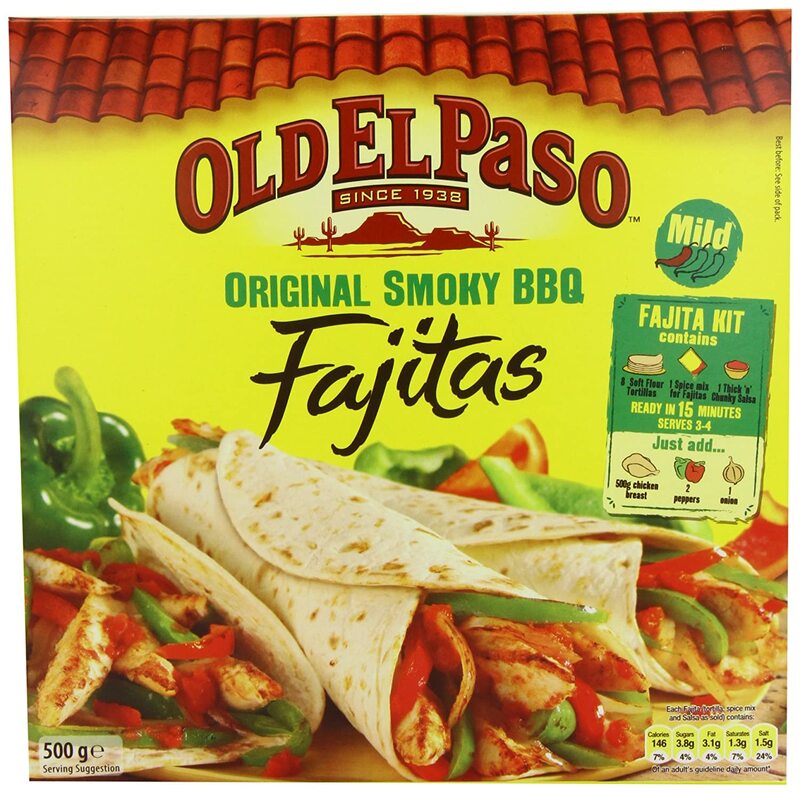 Something worth noting here is that they have used no more than three colours throughout the piece of marketing. As a web designer I could use this idea to promote what I do, this is something I will consider for part of my promotional piece. Self promotional item is important because promotes you and your services, if done correctly it can gain you customers. There are many things you can do, from providing a portfolio of your work to a simple toy or gift that the customer will want to keep so that they are constantly reminded of you. What is the point of this piece? This piece of self-promotion is something you can send a potential client when they are half interested in your services. It needs to contain some person info to make me interesting, tel the client what I do, why i’m the best and then close the sale to get them to contact me to take up my services. I will research this then decide how I will do it myself. It is design help sent in a box, all the cures for every types of different design jobs, this way the client has a fun experience of the designer but also learns what Wong does, brilliant self-promotion. Something I noticed is that each one has a consistent design throughout, which helps with continuity. This can be seen here really well too where George has put a portfolio of his work together and uses a colourful diamond system to give it a nice overall design. So from my research I have found that continuity in the design is important, making it interesting for the client to use is a massively important and if you can get them talking about it to others, even better. In a sense having a gimmick, something for the client to play with makes them look at your branding longer so you are winning more advertising time with them. Continuity, interesting and gimmicks are the three most important things I have learn’t from my research so my next step will be to decide what I will create. To understand the process of creating a physical hand out like a business card or letterhead, I found it was vital to research the companies that produce these things. 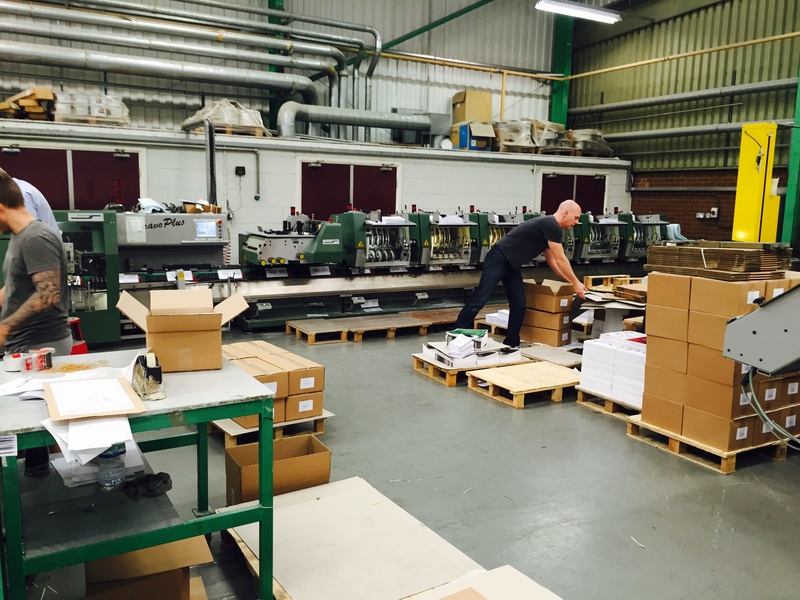 I organised a visit to G.F. Smith, the paper manufacturer and Wyke Printers. 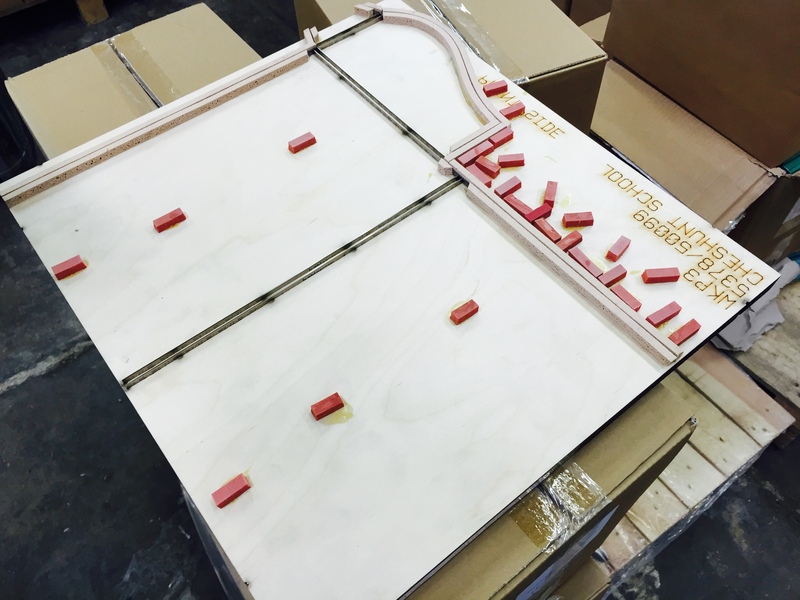 One of the first things I learnt when being showed around Wyke Printers was about the ‘blueprint’, a paper cutout of anything that needs to be folded and cut to create a certain shape. 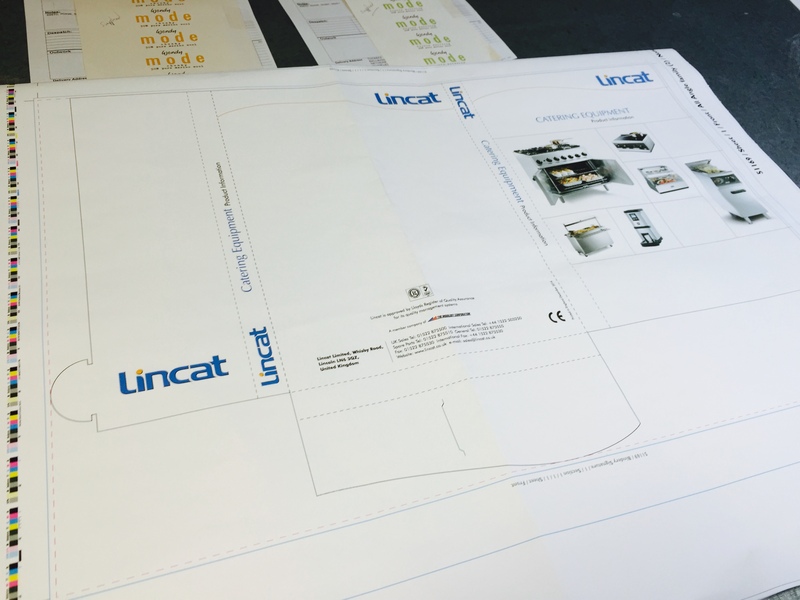 The photo below shows the blueprint design for a folder that the company Lincat are paying Wyke printing for. You can see the design has dotted lines for folds and hard lines to be cut. The layout of the content is shown as it would be so that should there be any mistakes, they can be easily resolved. There are many machines in the building that do lot’s of different jobs, things like stapling books together, printing, checking colour levels etc. 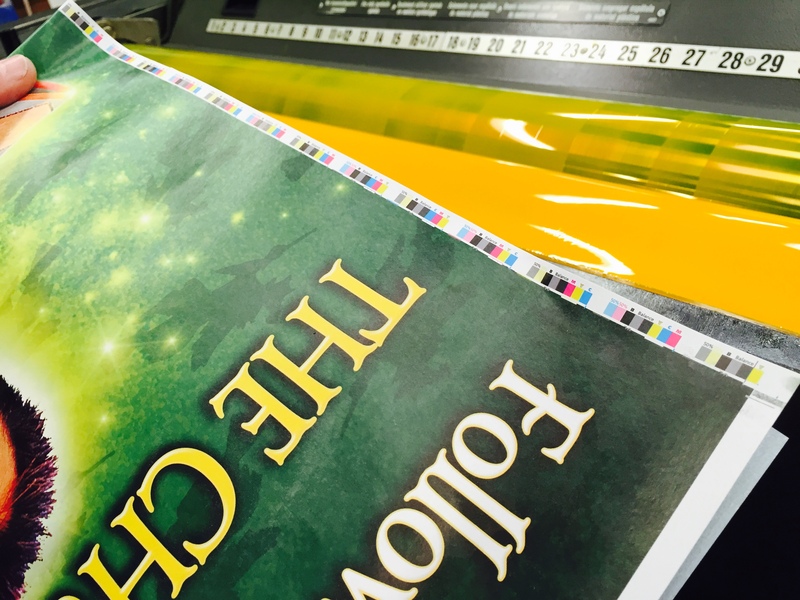 Along the top of each piece of paper printed, there is a set of colour codes which are read by the computer system, this will determine whether each machine has the correct amount of each colour in it. Wyke use CMYK (reason for this has been mentioned in previous research). You can see the numbers on the machine actually match up to the different colour sets on the paper. 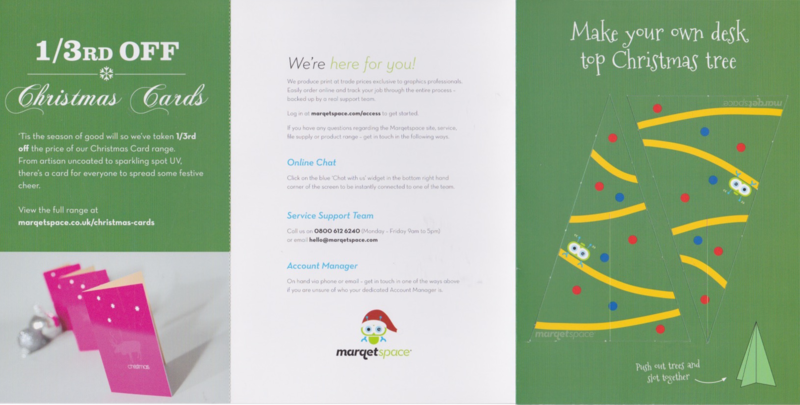 Irecieved a letter from Marketspace, a printing company based in London, this letter was to make me aware of a christmas promotion they were offering their customers. 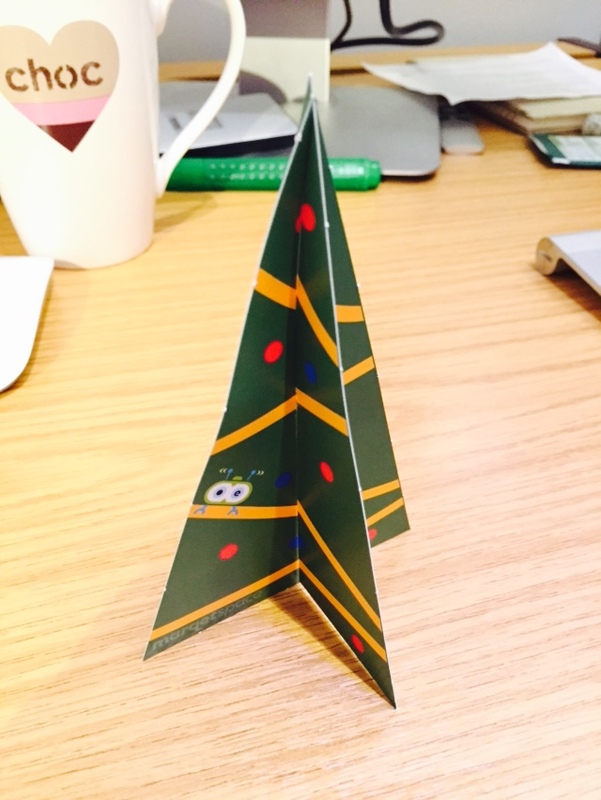 Included was a pop out – make it yourself christmas tree. I thought this was a brilliant example of self promotional material so I have decided to share it on my blog. Below you can see the images of the document and then the final version of the tree cut together on my desk. When a company gets you to play with a self promotional item they have sent you, they have effectively won you as a customer and they are more likely to be used over their competition.